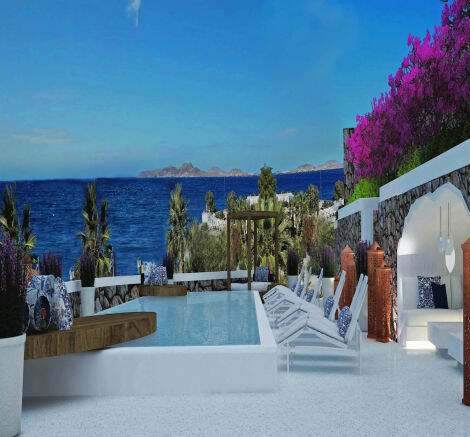 Located right on the beach of Agios Ioannis in Mykonos, Katikies Mykonos is a 5-star boutique hotel featuring a selection of fine dining options, 2 infinity pools, a spa centre and a gym. Blending Cycladic style with modern elements, the hotel offers elegantly decorated rooms and suites with unobstructed sea view.Featuring private pools or outdoor jetted tubs, the units at Katikies Mykonos open to a private terrace with lounge area. Facilities include a flat-screen satellite TV, I-Pod music player, Nespresso coffee machine, in-room safe and mini bar The modern bathrooms are fitted with hairdryer, bathrobes, slippers and free toiletries. Room service is available 24/7. With a stay at Bellissimo Resort in Mykonos, you'll be near the beach, steps from Agios Ioannis Beach and a 4-minute drive from Ornos Beach. This hotel is 3.1 mi (5 km) from Mykonos Old Port and 4.9 mi (7.8 km) from Paradise Beach. Make yourself at home in one of the 17 individually decorated guestrooms, featuring refrigerators and flat-screen televisions. Rooms have private furnished balconies. Complimentary wireless Internet access keeps you connected, and satellite programming is available for your entertainment. Private bathrooms have complimentary toiletries and hair dryers. Make yourself at home in one of the 76 air-conditioned rooms featuring refrigerators and LCD televisions. Rooms have private balconies or patios. Satellite television is provided for your entertainment. Bathrooms have bathtubs or showers and hair dryers. Make yourself at home in one of the 19 air-conditioned rooms featuring minibars and espresso makers. Rooms have private furnished balconies or patios. Smart televisions with satellite programming provide entertainment, while complimentary wireless Internet access keeps you connected. Private bathrooms with showers feature rainfall showerheads and designer toiletries. Enjoy a meal at the restaurant, or stay in and take advantage of the villa's room service (during limited hours). Quench your thirst with your favorite drink at the bar/lounge. A complimentary cooked-to-order breakfast is served daily from 8:00 AM to 12:30 PM. Enjoy Greek cuisine at Dolphins of Delos, one of the hotel's 2 restaurants, or stay in and take advantage of the 24-hour room service. Snacks are also available at the coffee shop/café. Relax with a refreshing drink from the poolside bar or one of the 2 bars/lounges. A complimentary hot/cold buffet breakfast is served daily from 8:00 AM to 11:00 AM. Grab a bite from the snack bar/deli, or stay in and take advantage of the aparthotel's room service (during limited hours). Relax with your favorite drink at the bar/lounge or the poolside bar. Continental breakfasts are available daily from 8 AM to 11:30 AM for a fee. With a stay at Voula Apartments in Mykonos, you'll be minutes from Agios Ioannis Beach and close to Ornos Beach. With a stay at Voula Apartments in Mykonos, you'll be minutes from Agios Ioannis Beach and close to Ornos Beach. This hotel is close to Mykonos Old Port and Paradise Beach. This hotel is close to Mykonos Old Port and Paradise Beach. Make yourself at home in one of the 11 individually decorated guestrooms, featuring kitchenettes. 21-inch flat-screen televisions with digital programming provide entertainment, while complimentary wireless Internet access keeps you connected. Conveniences include desks and refrigerators, and housekeeping is provided daily. 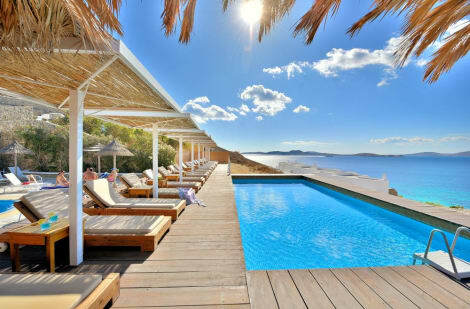 lastminute.com has a fantastic range of hotels in Agios Ioannis Mykonos, with everything from cheap hotels to luxurious five star accommodation available. We like to live up to our last minute name so remember you can book any one of our excellent Agios Ioannis Mykonos hotels up until midnight and stay the same night.